There are always some interersting playing card projects on Kickstarter. 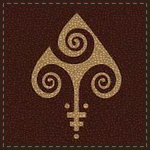 Today PlayingCardCollector.NET wants to draw your attention to Cultura Playing Cards by Mankin Chan. 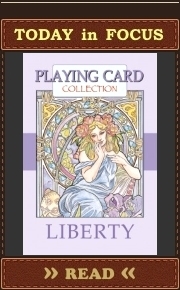 The deck has interesting cultural concept, and consists of 54 different artworks. It is inspired by the cultures of Italy, the Netherlands, USA, and China. Every suit is devoted to the country: Spades – Italy, Hearts – the Netherlands, Clubs – USA, Diamonds – China. Four cards of each number represent different categories: ace – flags, two – countries themselves, three – drinks, four – bread, five – dishes, six – sports, seven – transport, eight – houses, nine – landmarks, ten – animals. Jacks and Queens demonstrate traditional clothing and other specific cultural elements. Kings are represented by historical characters of appropriate countries. See it on the “Kickstarter Projects” page. 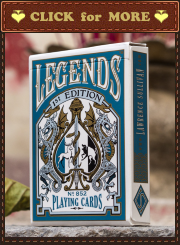 Bicycle Celtic Myth 3d Edition Playing Cards by Cultúrlán Enterprises.